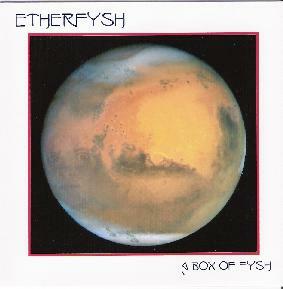 Etherfysh - "A Box Of Fysh"
Etherfysh fits rather comfortably into the often nebulous hybrid genre that attempts to graft elements of world music onto a new age framework. And as with other artists of a similar bent, the degree of success is often contingent on both harmonic and rhythmic complexity. None of the six compositions on A Box of Fysh can be said to display either, though there are certainly enjoyable moments on several pieces. Airy and annoyingly pleasant, "Rama" and "River of Mills" flash with all the cold fire of costume jewelry. The ephemeral sparkle, attractive as it is on the surface, doesn't last under closer scrutiny and sustained observation. But as aural wall paper for nocturnal meditation while reading Swinburne or Matthew Arnold, each of these pieces creates a suitable background environment. That's quite an achievement for a new age artist. But anonymity of both style and purpose has and will forever be the bete noir of digital music, and this is the essential weakness of A Box of Fysh. One can only recycle ready-made sound textures, factory programmed synth patches and pre-constructed rhythm patterns for so long before the listener is left with a sense of apathetic enjoyment, a close analog perhaps to the experience of watching tropical fish in your aquarium. Displaying neither technical brilliance nor creative anarchy, the fysh remains in the box, never daring to explore even the borders of its confined space, much less the undiscovered country beyond. If this is your preferred vintage, there's far better to be savored than the dregs you'll find in A Box of Fysh. For more information you can visit the Etherfysh web site at: http://www.etherfysh.com.